Dragons abound in mythology and folklore, stimulating the imagination with their serpentine or reptilian forms and their ability to fly and breathe fire. Dragon images and descriptions are so common in art and literature that you might believe they are real. No one really knows the origin of these mythic creatures, but across cultures and across the world they share many common features. Your dragon can be broken down into simple shapes such as circles, ovals, arcs, curves, and triangles. The approach is similar as those for drawing other animals, such as a frog or a gorilla. To begin, lightly sketch a circle and oval for the head. Sketch an elongated s-curve for the dragon's spine and add a similar curve for the dragon's belly. Use arcs (part of a circle) to create the dragon's horns. 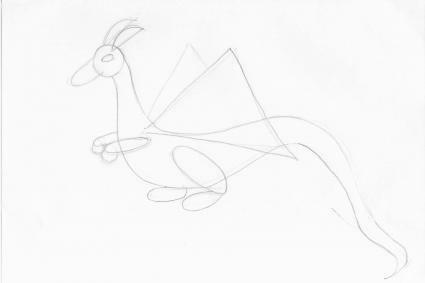 Use ovals and circles to sketch in the dragon's legs and feet. Sketch large triangles for the dragon's wings. Start drawing the dragon's features, including her legs, claws, horns, eye, and nostril, using heavier lines than those you used for your initial sketch. As you work, use your eraser to clean up the sketch lines. A plastic or kneaded eraser will not tear your paper and will not leave as much eraser "dust" as a rubber eraser. Add lines to define the wings. Add texture and shading to the head, body and tail. Continue enhancing your dragon by adding details of your choice. 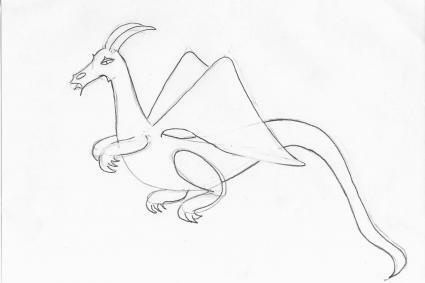 Darken the outlines and add shading to make your dragon appear more three dimensional. If desired, you can use your fingertip or a cotton swab to smooth shading. Finally, use your eraser to remove unwanted lines and marks. In this step, you can finish by adding color to your drawing if you wish to do so. A dragon's body is usually depicted long and curved. Depending on the source, the dragon may have no legs, or it may have lizard-like short legs and feet with long claws. Many dragons, especially in stories and art from the West, have wings to let them soar majestically above their domains. The dragon's head is an elongated horse-like in shape with large, exaggerated nostrils perfect for breathing fire. The eyes are often narrow slits resembling those of a snake or lizard. Cartoon dragons often feature soft curves, eyes that are wide open, and few sharp angles. Fiercer dragons have sharp horns, scales, and ridges. Acute angles are used to add to the fearsome images of traditional dragons in both Western and Eastern traditions. Now that you have drawn a dragon, there is no limit to the variations and embellishments you can add to your drawing. Because a dragon is a mythical creature, its features, coloration, and abilities are limited only by your imagination. If you need further inspiration, book illustrations and the Internet are great sources of dragon images from both Western and Eastern traditions. To expand your knowledge of how to draw dragons, you may enjoy the book Dragonart Evolution: How to Draw Everything Dragon.